Extremely Gentle but Cleans Deeply! I've used this on and off for years since modeling school and modeling. It does remove makeup, grime, and oil in the most tender way. My skin is immaculate after using it and not taut, but quite soft. Cleans fairly well. Doens't have much of a smell to it. Not very thick (I tend to like thicker face cleansers) so I'm probably using more than I would if it was thicker. 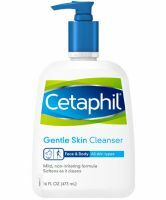 I'm not a big Cetaphil fan but for those who want a very gentle, nonirritating cleans then this one is for you! I have never had another skin cleanser do this to my face but after you wash it off, your skin is left feeling really soft almost as if there is still residue left on your face. It is such a weird feeling I couldn't get used to. I just felt like my face wasn't clean enough after using this. I have oily skin so I think it would be better suited for someone with dry or sensitive skin since this has a moisturizing effect after you wash it off.